Polish Pottery Stoneware Covered Baker. Handmade and beautifully hand painted in Boleslawiec region of Poland. Each piece of Polish pottery stoneware is handcrafted by an artist; therefore, no two pieces are exactly alike. Stoneware bakeware distributes heat efficiently for even baking and browning. Lid helps retain moisture and is ideal for braising meats or creating flavorful soups or stews. Use without lid for roasting whole chicken or turkey breast. 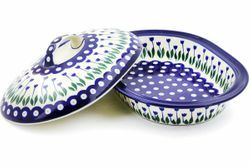 This Polish pottery stoneware baking dish is dishwasher, microwave, freezer safe and oven safe to 400�F. Stoneware evenly distributes and retains heat, so your just-out-of-the-oven foods stay hot longer. No presoaking needed before use. The glazed interior is nonporous so it doesn't retain oils, odors or flavors.